Cavansite opens the Third Eye and Crown Chakras, and stimulates psychic development, intuition and channelling abilities. It often occurs with Stilbite, which connects with the Crown Chakra, but is also very grounding. The effect of the two together allows a powerful spiritual and psychic connection while keeping firmly rooted to the ground. The crystal has been used in treatment of eye, bone and blood disorders. 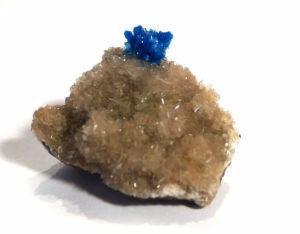 Cavansite is found in basalts and tuff, in association with zeolites such as stilbite and heulandite. The most beautiful specimens come from Pune, India, an area known for its zeolites and apophyllite. It was discovered in Oregon, USA. Cavansite is named for its chemical constituents, calcium (Ca), vanadium (V) and silicon (Si).